Fate Line has started at an early age on Life Line and has gone upto Headline and stops there. For sometime, the native must have followed her father's profession. Then a new line starts on Head line at the age of 35 and joins the Heart line at the age of 55. This Line has completely changed the attitude of the subject towards the past way of life. "Troubles are often the tools by which God fashions us for better things"
This has been proved true in the case of Phoolandevi, once a dacoit who terrorised the Chambal ravines, now reformed and serving the people through politics. 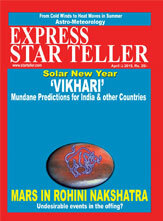 Phoolandevi, who has withstood many onslaughts against her, is a firm believer in astrology. 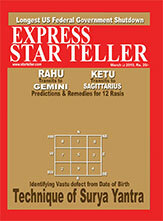 According to her, astrology is a subject of the ancient past of the Hindu Rajya. However in her case, some predictions have come true and some have not. Phoolan recalls an occasion. "I was planning for a surrender. It was inside the deep jungle on a hot sunny day. Myself and my associates were cooling ourselves in a lake nearby. A Baba called me aside and touched my forehead. Then he said that I will surrender in two months time and I will have to fight for my cause. I not only surrendered but also struggled to come out of the jail. Baba's prediction turned out to be true. During another occasion, when I was in Gwalior Jail, an inmate who knew astrology asked me to keep some wheat grain before him. I did so. After some calculations he said that I would be released before he would be out of jail. I was released and the prediction came true. I met yet another astrologer in the same jail who after looking at my palms wondered why I was still languishing in the jail as I was destined to be a leader. I didn't take his predictions seriously at first. But later when I became a M.P. from the Samajwadi Party, his prediction also came true. Another pandit once told me that I will go abroad. I visited many foreign countries". Phoolan believes in Goddess Durga. "Durga Maa has stood by me in my good and bad days. I have faith in her" she said. The ex.dacoit Queen said that she herself had not taken the gun on her shoulder to become a Dacoit. It was only the circumstances which were responsible for it. "I was kidnapped by a dacoit in my childhood. Therefore I had to fight for survival" she alleged. Phoolan insists that the film "Bandit Queen" was filmed by Shekar Kapoor inspite of her opposition. She is of the opinion that the dreaded poacher Veerappan should surrender and face the law. Phoolan who represented Mirzapur constituency in U.P. claims that she had undertaken many welfare measures for the upliftment of the Adivasi tribes. She is wearing a Pukraj ring to benefit her rashi and a white Topaz ring presented by a Baba. She claim that her age is 36 years. She believes that she was born during the monsoon between June and July, 6 days after Sri Krishna Janmashtami, near Sheknuragoda in U.P. Life Line starts leaving a gap from Head line and goes down upto age 52. Then there is a break. A new line by its side starts and goes down. This indicates that the subject will be sick and hospitalised at the age of 52 for some time. The new side-line saves the subject from illness and extends the longevity upto age 65. From the age of 52 to 65, the subject will not have good health. Head Line starting with a group from Life line indicates extreme rashness of nature and falling into danger. Thumb short and thick in the second phalanx, indicates that the subject is responsible for a number of deaths. A horizontal line from the region of the base of the thumb cutting the Line of Life shows obstacles in life caused by others, especially domestic life. A large Venus Mount, Line of Head drooping downwards. A cross in the triangle; short Headline and Heart line all these factors are responsible for the murders, the native committed. Fate Line : A line has started at an early age on Life Line and has gone upto Headline and stops there. For sometime, the native must have followed her father's profession. Then a new line starts on Head line at the age of 35 and joins the Heart line at the age of 55. This Line has completely changed the attitude of the subject towards the past way of life. The native would he well settled in life between the ages 35 to 55. The subject will have good prospects during this period. The same Fate line goes upto age 70. Regarding the marriage line on the Mount of Mercury, there exist two lines, one at the age of 23 and the other at 30. The subject might have settled down in marital life at the age of 30. Mount of Venus is normal in size. A strong line on this Mount indicates that the subject must have one son with strong constitution. Mount of Moon : being developed well indicates the native's wide imaginative power. A square on Life line is the cause of the subject's conviction in a criminal case. Well developed Mount of Jupiter has led the subject to good status in life. An island on the Fateline at the age of 56 will get the subject into trouble financially and otherwise. But, as the line proceeds further, it may not last long. Sun Line is well formed from age 35 to 42, then the line has got distorted. This will affect the native financially.